China’s October crude imports hit a record 9.61 million barrels per day. CNBC’s Jim Cramer said he sees a path for U.S. crude to fall to $40 a barrel as growth in demand moderates and supply rises. However, Chinese trade data released Thursday showed the country’s oil imports rose to an all-time high at 9.61 million bpd in October, Reuters reported. Crude futures also drew support on Wednesday from a report by Russia’s TASS news agency that Saudi Arabia and Russia are in talks to push a group of about two dozen oil producers to cut production. A committee representing the group is set to meet this weekend and could make a recommendation to the wider group, which meets next month. 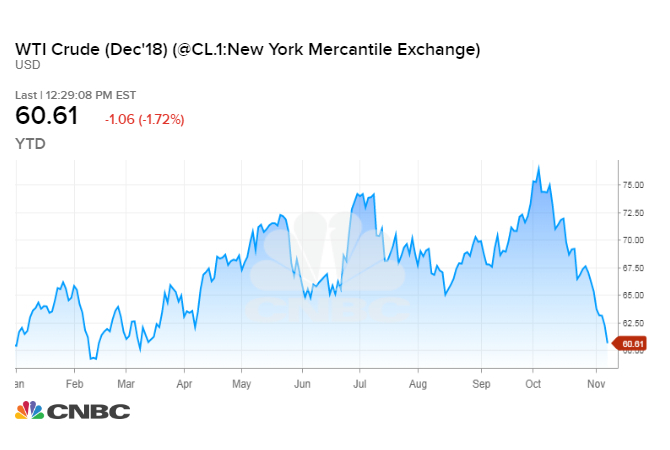 Last month, the committee said supply is “very comfortable” relative to demand and warned that macroeconomic uncertainty could force OPEC and its allies to begin cutting output again.